Building an emergency fund: How can you do it in 6 easy steps? It is known to all that everyone should have an emergency fund which can help you sustain in your rainy days. It is known to all that everyone should have an emergency fund which can help you sustain in your rainy days. You never know when a financial emergency may require you spend a few dollars; doing so which you might fall into debt problems. So, it is always better to have an emergency fund which you can use in times of financial emergency. However, it might be difficult for you to build this fund after meeting your daily necessities. Though the amount you need to have in your emergency fund may vary, yet there are few steps which everyone can follow in order to have an emergency fund. Figure out how much you require -In order to build an emergency fund, at first you need to figure out what amount will take care of your rainy days. This is because everyone’s lifestyle is different. So, deciding on the amount will keep you motivated to grow that in your emergency fund. As per the financial experts, the general rule is to save as much which is enough to cover your six to seven months’ worth of expense. The needs and wants vary from one person to another; therefore, you need to figure out how much you need to have in your emergency fund. Set a reasonable goal to build it -As mentioned, it is always better to have your emergency fund worth of sustaining for about six to seven months. However, that requires saving a big amount which might take you years to achieve. Therefore, in order to stay motivated, you can set your initial goal at a relatively smaller amount, such as, saving an amount worth of your two months’ of expense. This will make you motivated to save more and as you’re able to save that amount, you will be happy that you have built a decent amount for the rainy days. Include the item in your monthly budget -Forced savings is necessary when it comes to saving for the rainy days, as otherwise, you might use the amount for meeting your daily necessities. One of the best ways to do so is treating the amount as one of your bill payments, which you have to do every month. Once you get your paycheck, you can pay this amount to your emergency fund through direct deposit. However, do not use this money if you fall short of dollars before you get your next paycheck. As already mentioned, either treat this amount as paying one of your bills or subtract this amount from your paycheck while planning your budget. Choose where to save your money -It is very much necessary to save your money in a place where you cannot access it easily; otherwise, you will be tempted to use the money whenever you need, even for daily use. Therefore, it is easy to open a separate account in your bank where you will save for your rainy days. Alternatively, you can have an account with a credit union as usually they allow you to open one with a relatively smaller amount. If you have your emergency account in your bank, then keep the debit card elsewhere and not in your purse, so that you are not tempted to use it for meeting daily necessities. Do not try to build it fast -It is said that ‘slow and steady wins the race’. So, never try to grow your emergency fund fast. Try to save a certain amount every month in order to build your emergency fund as otherwise, you might be tempted to pull dollars out whenever necessary. You can start by putting a certain amount every month and increase it with time. For example, if you have been paying $60 on any of your credit cards and you are paying off the outstanding balance this month, then increase your contribution, that is $60, into your emergency fund from next month. This will help you grow your money with ease. Find out ways to save money -It is easy to say than done to save a certain amount, especially for someone who sometimes has to struggle to make ends meet. In such a situation, there are certain ways to save extra dollars. For example, you can request a rate reduction in one of your credit cards or shop around for a better insurance rate for your car or home. Sometimes the insurance companies also offer multiple policy discount if you purchase multiple insurance policies from a single provider. There are also many other ways to increase your savings every month such as, reducing eating outs or opting for carpool to go to office. You just have to find a way to out to increase your savings every month. Another exciting way to save more every month is to start a competition with one of your friends or family members. Start by deciding on a minimum amount every month and see who can save more in order to build the emergency fund. This is a fun way to build your emergency fund. Another way of saving is tossing the extra coins in a jar every day. Though it amounts to a very little amount, yet every cent helps in accumulating the desired amount. 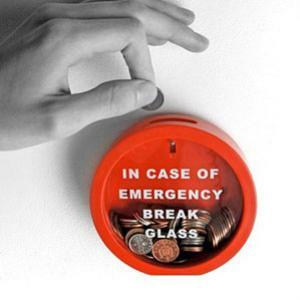 Emergency fund is for your financial emergencies which you cannot predict and not for your monthly or annual expenses. To avoid pulling out money from your emergency fund, make sure you plan an annual budget and/or make an allowance for this in your monthly budget as well. For example, you might have to make an insurance payment for your car once a year. So, the month you have to make the payment, it might not be possible to include that amount in your monthly budget; hence, you use the funds accumulated in your emergency fund. To avoid doing so, list your annual expenses and set aside a certain amount, to make the payment, every month. Following this, you will be able to grow your emergency fund with ease over a certain period of time and can remain stress free.